Mea Culpa, mea culpa! I have not restarted this blog and we are now on the move again. Just to catch up. We returned to the boat in Fort Pierce in mid-October by rental car. Flying was not an option since we had collected so much valuable stuff (ie junk) over the summer. We did not rush south and made it a bit of an American history tour with visits to Gettysburg, Williamsburg, and Charleston. The Americans certainly do a terrific job of preserving and presenting their history and we enjoyed all of these visits. Charleston was new to me (they were all new to June) and seemed to be a lovely spot – at least in the downtown area. When we got back to Riverside Marina in Fort Pierce we had lots of work to do. First thing was to put everything back together since we had stripped the deck to prepare for any possible hurricanes, not to mention the strong Florida summer sun. We also had to figure out how to use our storage space more effectively than we did last year. To be fair, Ainia has a huge amount of storage space, at least for small and medium sized things. In our first year’s cruising we did not use our space that effectively but this was not a problem since we our space exceeded our stuff. This year that was not the case as we had a lot more to store – in particular, lots of foodstuffs to prepare for the long passages and poor shopping in the Pacific. This organizational process took quite a long time. We also had several significant projects to do. These included installing a new shower system in the forward head (the entire shower compartment in the aft head has become storage only for several large plastic storage boxes of food, backpacks, and the asymmetric spinnaker when we have visitors (without visitors this sail lives on the forward berth). We even disconnected the shower fitting in the aft head so it could not get turned on by movement of things stored there (ask me how I know about that problem). We also installed two new pumps – one for the pressure water system and one large bilge pump. The big job was installing new standing rigging and new lifelines. We decided to have the rigger swage the fittings on the upper end of each piece of wire with the final measurements being done by us with Hayn Hi-Mod fittings on the bottom. This is all done except for one of the upper shrouds. The shroud is held onto the end of the spreader by a cap held in place by two bolts. I got one out (and the two on the other spreader) with PB Blaster (a penetrating oil designed for this sort of problem) and have left the other for the time being to see if it will loosen up with the other bolt out. If that does not work I may to cut the current shroud at the spreader and either pull out the rest or, worst case, drill it out. This would all be a big job working 30 feet in the air. Doing the rigging with the mast up meant going up and down many times in the bosun’s chair and we found a good way to do it. 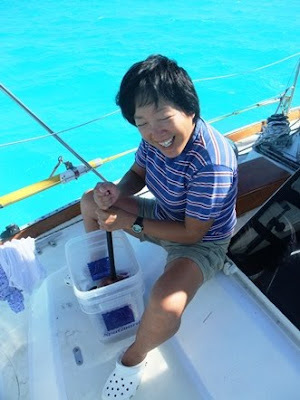 We replaced one of the spinnaker halyards with a longer piece if line that we are able to lead through two very large blocks to the electric anchor windlass. This setup, along with a second halyard as a safety line and a comfy bosun’s chair made the task relatively simple and saved us a couple of thousand dollars compared to having the whole job done by the rigger. From Fort Pierce we went down the ICW for two short days to Lake Worth w (West Palm Beach) here people traditionally wait for a ‘weather window’ for crossing to the Bahamas. Here we met Fred Cashin, another Whitby YC member who was joining us for a couple of weeks and John and Marina on Kailani, a PDQ Antares 44 catamaran. They are from Victoria BC and will be sailing with them to Panama. We waited for the right window – and we waited – for a week of north winds with reports of waves in the Gulf Stream of up to 22 feet. We finally had a brief opening and off we went. We did an overnight all the way to Nassau to check into Customs ($300, ouch) and spent the night anchored at a little island just outside Nassau. In the days that followed we had terrific weather for a leisurely trip down the Exumas to George Town,’s with stops at Norman’s Cay (famous for its sordid history as the major transhipment point for cocaine from Colombia going to the US in the 1970s and 1980s), Warderick Wells (Exuma Park), and Staniel Cay (swimming pigs and Thunderball Cave). The latter two spots are described in more detail in an earlier posting. Posted by Bruce at 3:07 p.m.